This is the second part in my series about the authors and books who have inspired my writing. J.R.R. Tolkien was the subject of the first post in this series. 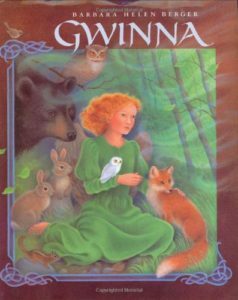 Gwinna by Barbara Helen Berger was one of the first books I discovered in my elementary school library after my parents stopped homeschooling us. I was just beginning the fourth grade that year. The library was a beautiful introduction to public school as well as to contemporary fantasy stories that reminded me so much of the traditional fairy tales I already loved at that age. This book started off with a childless couple begging the Mother of Owls to help them have a child. The Mother of Owls agreed to grant their wish on the condition that they return their daughter to her when the baby turned twelve. They agreed, and so little Gwinna joined their lives. As Gwinna grew, her mother noticed that the girl was beginning to develop wings. She bound her daughter’s wings tightly so that no one would notice her child was different from other children. Gwinna’s parents also refused to tell her about where she came from or allow her to go back to the Mother of Owls when she turned twelve. Eventually the Mother of Owls had to intervene, and that is when when the plot really became interesting for me. Gwinna wandered into the forest to find out what had caused all of the strange things that were happening in her adoptive parents’ home. She found the Mother of Owls and finally discovered what had been hiding underneath all of the bindings her adoptive mother had wrapped around her. If you want to find out what happened after that, you’ll have to read this story for yourself! With that being said, these are the things that I deeply appreciate about Ms. Berger’s writing style. The main character lived in a world where magical and wonderfully unexpected things happen every single day. There are certain rules that everyone in this story must follow, though, and there are creative punishments for anyone who doesn’t obey them. People who did the right thing were rewarded in equally creative ways. I loved the fact that the author spent so much time constructing such a complex and fascinating world for a children’s book. This could have easily been expanded into a whole series about Mother Owl and all of the people and creatures under her care. I’m frankly a little surprised that Ms. Berger hasn’t written a sequel or two yet. There is definitely plenty of room here to show what happened to Gwinna next and if her adoptive parents ever spent time with Mother of Owls after their daughter grew up. I didn’t pick up on the adoption undertones in this book the first time I read it, but I’ve always loved reading the passages where the author described what happened to Gwinna once she learned the truth about her origins. Her shock and surprise was so genuine. Yes, the main character hated the fact that her parents had lied to her, and she was also eager to get to know her first mother. This didn’t change how she felt about any of her parents, though. There was plenty of room in her heart to care about all three of them. There were other messages tucked into the plot about perseverance, friendship, and remaining true to your genuine self regardless of whether or not the people closest to you approve. My childhood self didn’t pick up on all of them, but I sure did when I read this book again years later. I don’t know about you, but I’ve read more than a few stories in my lifetime that were either bogged down by too many descriptions or barely showed the reader what the settings and characters looked like at all. One of my favourite things about Ms. Berger’s writing style is that she always toed the line between showing her audience what a scene looked like and allowing us to imagine a few special things for ourselves. The illustrations were an incredibly gorgeous addition to this tale. They fleshed out parts of the storyline that needed it, but they were just rare enough that I still had plenty of chances to come up with my own ideas about what Gwinna’s adventures looked like. My most vivid memory of this tale was of wondering what it felt like when Gwinna flew through the air. Did her wings get cold when she flew so far up into the sky? What was it like to feel all of that wind running past your feathers? How easy was it to maneuver between one gust of wind and the next? Some of my questions about flying were answered, but the author left many more to my imagination. Thinking about what that experience would be like kicked off a lifelong fascination I’ve had with human flight. I occasionally still have dreams where I realize that I have wings and I start flying around wherever I am at that point in the dreamscape. In every one of these dreams, my wings have been brown and soft like Gwinna’s wings were. (My wings are darker than hers, though. Picture something about the same shade of brown as my hair). Gwinna hasn’t joined me in one of my joyful flights yet…but maybe someday she will! I’ll be talking about dreams, favourite children’s books, wings, and more on Twitter today. I hope to see you over there if you liked this post and would like to discuss it in more detail.